Get the WHOLE American River Rafting Experience! If you are looking for an authentic, fun and high quality experience to share with family, friends and colleagues then whitewater rafting the American river with River Runners is for you. River Runners is the real deal; down to earth and professional river guides, fresh healthy meals and white water river trips that seriously make other people wonder why our guests look so happy on the river. 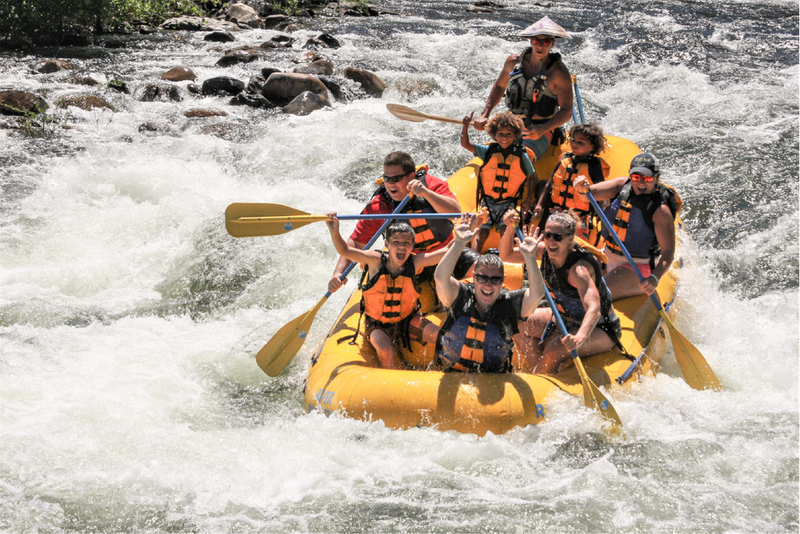 River Runners is run by locals and staffed by locals, some even grew up rafting on the American Rivers, they all know and love the American Rivers intimately and can't wait to share them with you. Everything about a rafting trip with River Runners hits the spot; the ease of being with fun and professional guides, the way we value the quality of your experience, the fun and exciting rapids and the way we help you enjoy the simple but satisfying pleasure of being out in nature. As one of our fans said recently "At River Runners your guides create an experience in two days that most people can only get on a 14 day trip on the Grand Canyon". A truly amazing outdoor experience! Our day with River Runners was more than a rafting trip, it was a connection with nature, the river and truly wonderful people; our guides John and Sarah. Both exhilarating and relaxing River Runners' premier two day whitewater rafting adventure on the South Fork of the American River is the best way to experience California's most popular river. Our trips are tailor made to not only impress you with the excitement of rapids but to also give you time to relax and play and to take in the beautiful scenery of the Sierra Nevada foothills. Our Two day/Two night trips INCLUDE two nights of camping at Camp Lotus, a private and grassy campground with hot showers and flush toilets. We provide you five meals all prepared fresh with fresh ingredients and served à la carte so you can make your plate the way you like it. We also provide you tents, campfires, smores and so much more! At River Runners we believe in making camping hassle free and enjoyable for our guests. This is class 3 California rafting at its best! You will love the river...all rivers after rafting the Gorge. This magical day begins gently and ends with a bang, giving you time to relax and experience the excitement of the South Fork of the American all in one day. This is a full day trip and includes lunch. This trip is suitable for many different excitement levels. Early in the morning the sun will be creeping down the steep canyon walls as you begin your descent from Chili Bar to Coloma. Beautiful, historical and exciting, this adventure introduces you to the fun and beauty of whitewater rafting. This is a slightly shorter trip than the gorge but is still a full day including lunch. This trip is suitable for many different excitement levels. If you are on a budget or are just looking for a half day experience, check out out Half Day Express Rafting Trips. All the excitement of the full day trips without the bells and whistles. Welcome to an incomparably stunning and thrilling full day experience. It is a perfect marriage of adrenaline, scenery, and togetherness. Be prepared to be overwhelmed. Be prepared to escape. The modern world is distant. Thoughts of your daily life will disappear thanks to the shear onslaught to your senses. here are many miles of verdant hills and the beautiful silence that a river canyon can offer. Camping options are available. Call for more information. Nestled close to Los Angeles is the steepest river in the Sierra Nevada mountains. Cold clear water sweeps the adventurous paddler out toward the central valley. Look over your shoulder and you will see 13,000 foot peaks covered in snow and giant Sequoia trees. Look downstream and you will see lots of whitewater. There is current from beginning to end. Big rapids are everywhere. Rocks are everywhere. Trees reach out into the widest of river channels. The river course changes every wet season. Only a well-seasoned guide can feel comfortable in this environment. And the guests lucky enough to be in their raft. One day rafting trips can be combined to create multi-day rafting trips depending on availability. Trips range from $95 - $310, call 530 622 5110 to discuss your needs.